We love our dogs, and fMRI studies show how important people are to dogs (their caudate lights up on smelling a familiar human, Berns et al 2014). Dogs can learn to follow pointing gestures, will try to comfort a crying stranger and respond to the sound of a baby crying. Chaser the border collie knows 1000 words. And we mustn’t forget how amazing the dog’s nose is (part of a series of four by Julie Hecht). Canine science even studies how dog's close relations, hand-reared wolves interact with humans (Gácsi et al 2013) and even get attached to them (Hall et al 2015). Dog training relies on well-established techniques of operant and classical conditioning, but more recent research specific to dogs and their owners can also help improve our training technique. Many studies show an association between the use of punitive techniques and behaviour problems such as aggression (e.g. Casey et al 2013; Herron et al 2009; Rooney and Cowan 2011). Studies also show the importance of timing, that dogs prefer food over petting and praise (Feuerbacher and Wynne 2012), that the type of treat matters, and even that dogs love to work to earn a reward (McGowan et al 2014). Science can help improve the welfare of dogs in many ways. It tells us the importance of socializing puppies (e.g. Morrow et al 2015; Freedman et al 1961), can help increase the rate of adoption of shelter dogs (e.g. Siettou et al 2014; Protopopova and Wynne 2014), explain how anti-depressants work in dogs and learn how to recognize signs of abuse in order to better help neglected dogs in future. It can tell us how to improve the welfare and performance of working dogs and even about providing enrichment for wolfdogs and wolves in sanctuaries. Strictly speaking, a lot of this research is psychology, psychiatry or medicine, but there’s plenty of it investigating if dogs (and other companion animals) are good for our health, whether that’s the physical benefits of getting out for a walk with a dog, animal-assisted therapy for adolescents with psychiatric problems, or how to avoid getting bitten by the family dog (because dogs don’t bite out of the blue). And it’s not just dogs that have benefits – it could be guinea pigs in the classroom (O’Haire et al 2013a, 2013b) or even a therapy llama. Also – and this goes back to how amazing dogs are – specially trained dogs can warn their owners of hypoglycaemia (Rooney et al 2013) or impending migraines. The story of how dogs evolved from wolves takes us back to our own pre-history, and so it tells us the story of how we came to be here. On a shorter timescale, our interactions with animals shape our story too: children with pets have a better understanding of biological concepts, and our earliest memories of pets may influence adult attitudes to animals. Canine scientists everywhere are looking for participants for their research. Some want dogs to attend their lab, e.g. to be trained to go in an MRI at Emory University, while others just need you to fill out a questionnaire from the comfort of your own sofa, as with this University of Lincoln study described by Julie Hecht. If you want to find a study to take part in, people who often tweet links to studies include this blog (@CompAnimalPsych), Mia Cobb and Julie Hecht (@DoUBelieveinDog, @DogSpies) and Fernanda Fadel (@ferrufa). And we can all watch SPARCS next month. These are six reasons, but we’ve only scratched the surface. 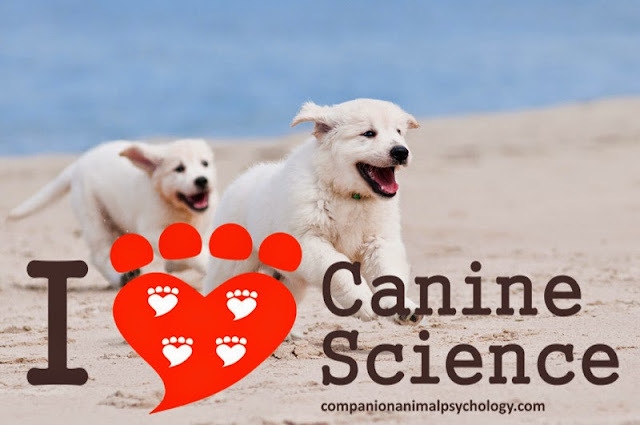 What do you love about canine science? You might also like: Why science matters to our dogs and cats and canine science is better than common sense.